We are happy to report that the White House Staff Files of Lee C. White is now fully digitized and available on our website. Lee Calvin White was born in Omaha, Nebraska on September 1, 1923. He remained in Nebraska to earn both his bachelor’s and law degrees before becoming an attorney. White began his career as an assistant to Joseph P. Kennedy, Sr. at the Hoover Commission and as a legislative assistant to then-Senator John F. Kennedy in 1954. By 1961, he became the Assistant Special Counsel to the President, working under the Special Counsel to the President – his former law school classmate, Theodore C. Sorensen. 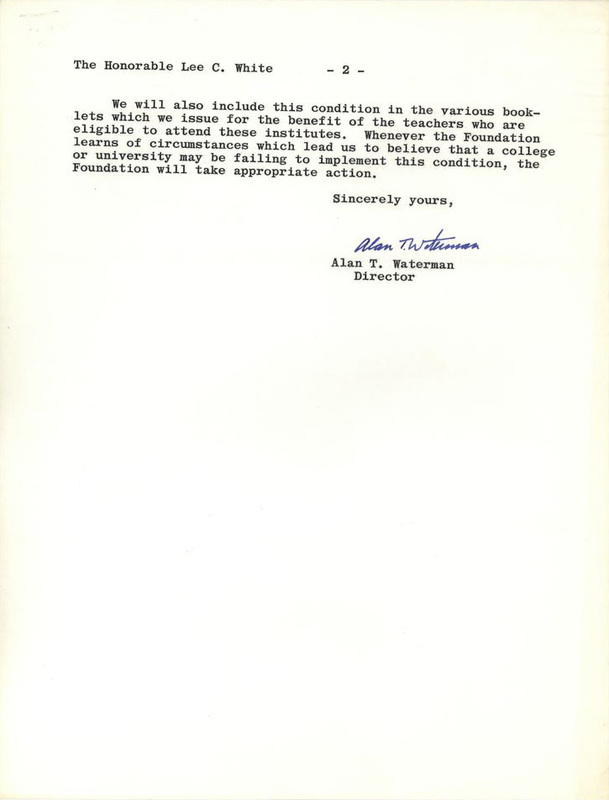 In 1962, Harris Wofford, Special Assistant to the President for Civil Rights, was appointed the Special Representative for the Peace Corps in Africa. In his wake, White assumed many of Wofford’s previous civil rights responsibilities, working toward equitable opportunities in employment, education, and voting rights. 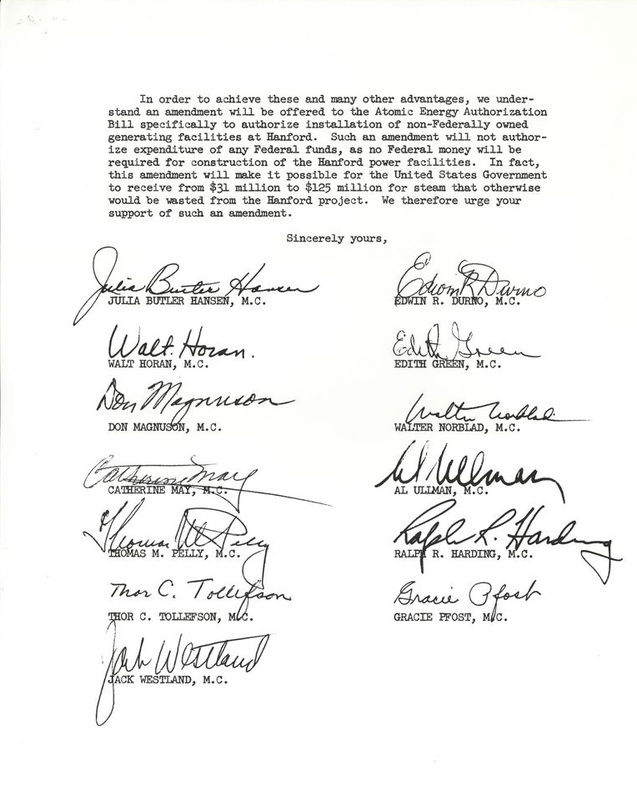 White was involved in several key civil rights issues and events during this time. He advised on specific federal civil rights issues: programs such as Plans for Progress; meetings with civil rights leaders including Martin Luther King, Jr.; the use of federal troops in civil disturbances; the 1961 Freedom Rides; the 1963 March on Washington; and the Civil Rights Act of 1964. He kept the federal government accountable for its adherence to equal opportunity employment, soliciting labor statistics from specific departments and agencies in the effort. 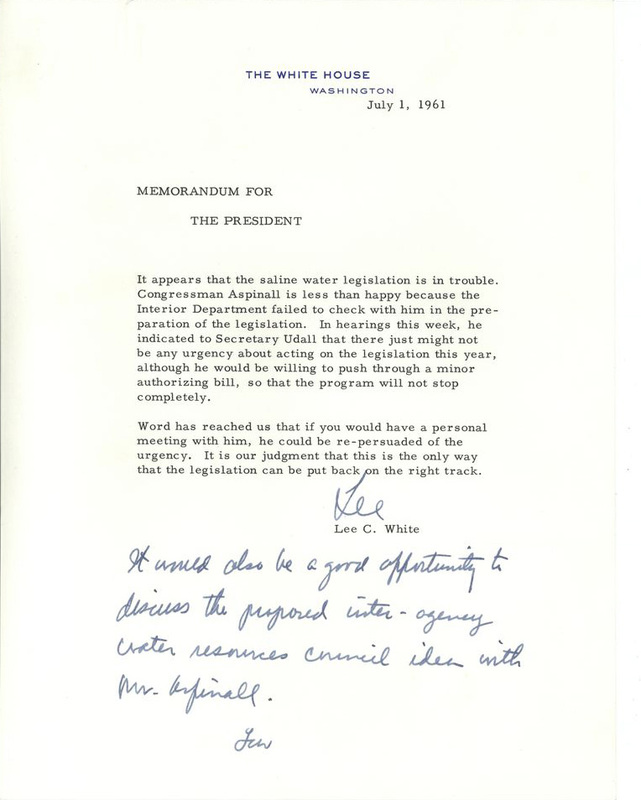 White also corresponded with civil rights constituents on behalf of President Kennedy, relayed current events directly to the President, or collected information that would inform the President’s strategies. 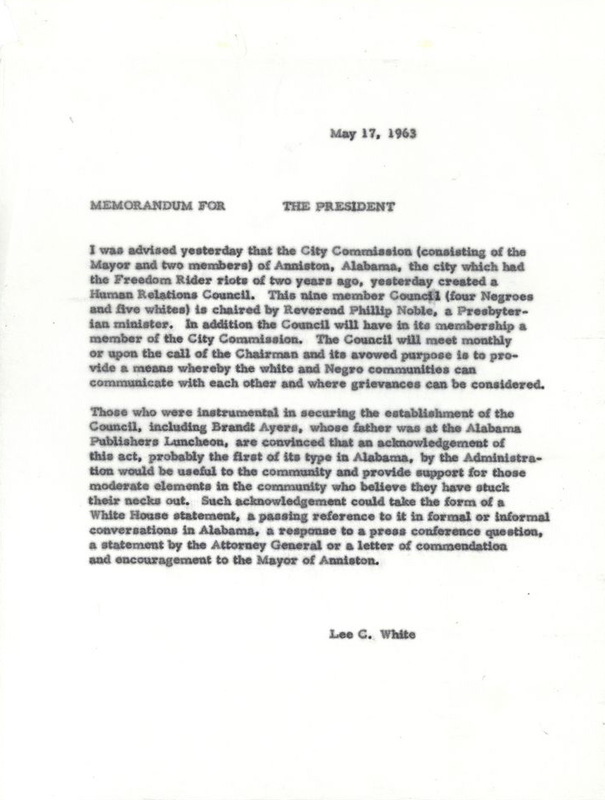 Memorandum to President Kennedy from Lee C. White regarding the formation of a bi-racial Human Relations Council in Anniston, Alabama, the former site of a Freedom Riders’ riot two years prior. View entire folder here. 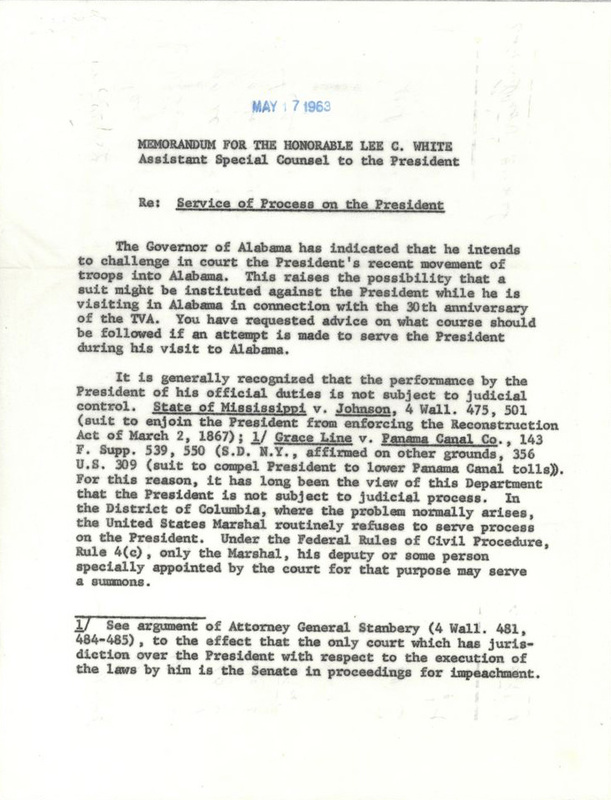 A memorandum from White House legal adviser Norbert A. Schlei to Lee C. White in response to White’s request for legal counsel concerning President Kennedy’s upcoming visit to Alabama. View entire folder here. 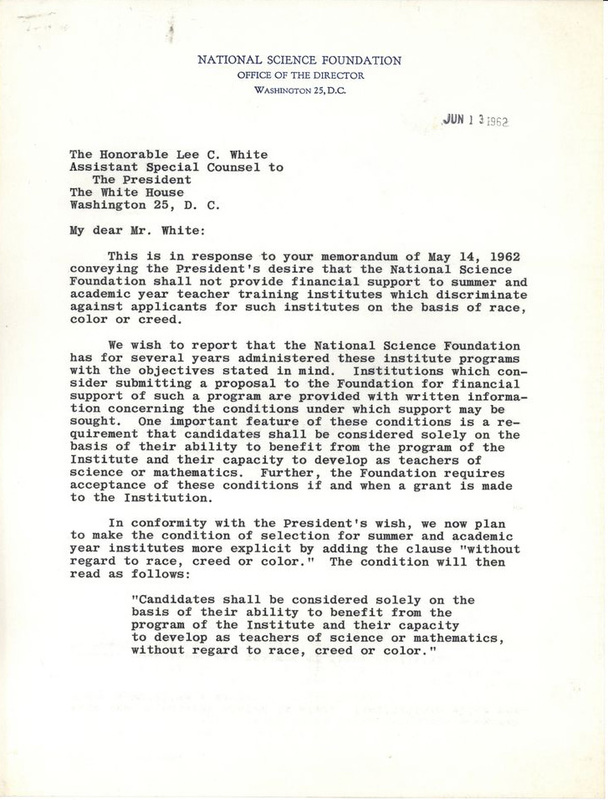 A letter to Lee C. White from National Science Foundation (NSF) Director, Alan T. Waterman, regarding the NSF’s adherence to President Kennedy’s directive not to fund discriminatory teacher training programs. View entire folder here. Lee White stayed on within President Lyndon B. Johnson’s administration as Associate Special Counsel and then Special Counsel to the President before becoming chairman of the Federal Power Commission in 1966. In 1969, White returned to practicing law as a partner in a private firm. After a career spent contributing to the progress of society through the law and legislation, White passed away on October 31, 2013 at the age of 90. 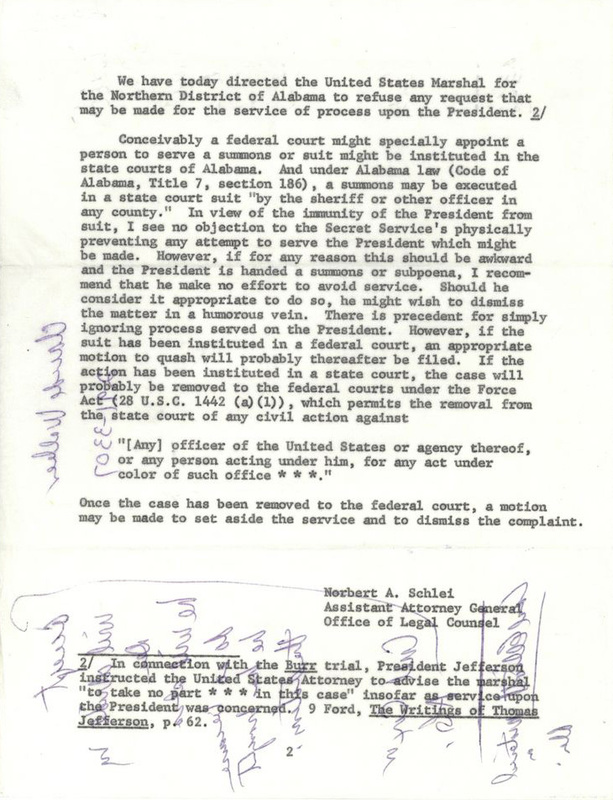 The White House Staff Files of Lee C. White consists of 24 boxes organized into two series: the General File (1954-1964) and the Civil Rights File (1961-1963). The collection reflects the range of presidential programs that White advised on in his capacity as Assistant Special Counsel and focuses primarily on legislation related to small businesses, natural resources, economics, and of course, civil rights. 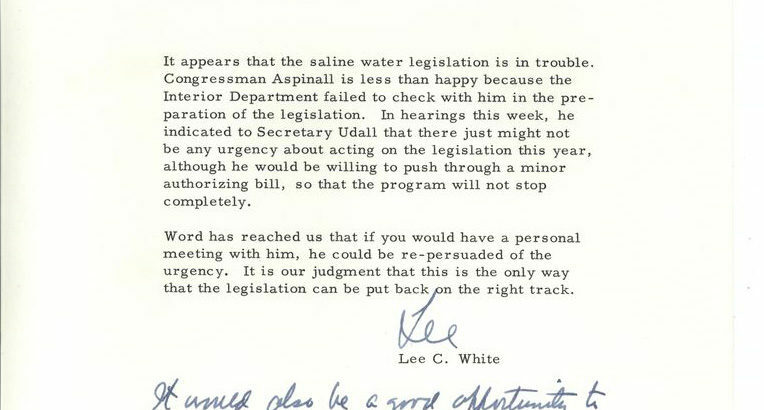 Memorandum from Lee C. White to President Kennedy advising the President on an upcoming bill for saline water conversion. View entire folder here. 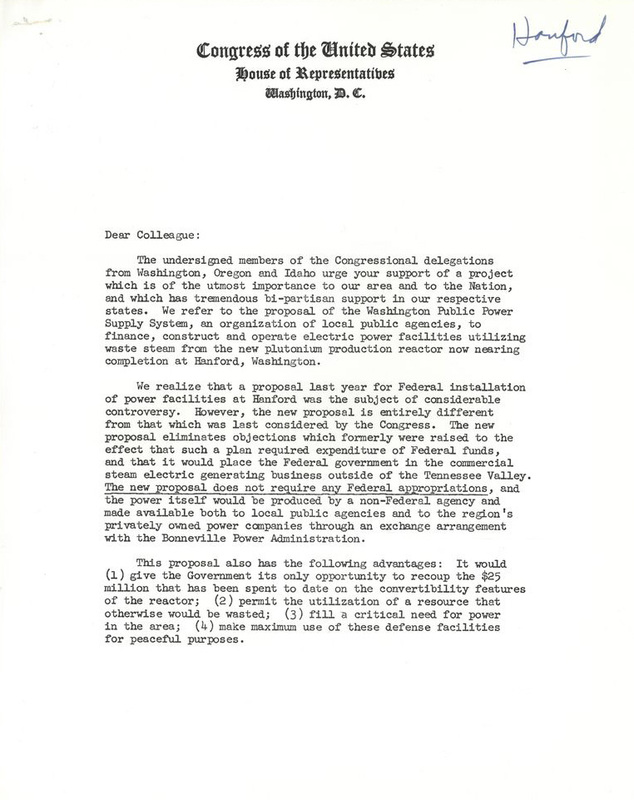 General letter from selected members of the House of Representatives soliciting support for an upcoming project to use waste steam from a plutonium production reactor to generate energy. View entire folder here.